Interiors by Meredith Ellis Design, Design by Sanders Architecture, and Build by David Wilkes Builders. Southern Living selects only one Idea House per year, and has been building them in cities all across the South for nearly 30 years. 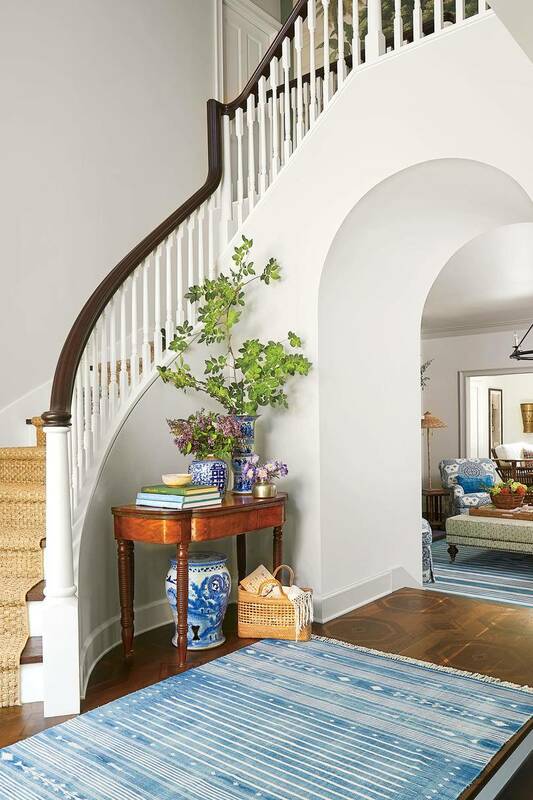 This year, Southern Living came to Austin and took on a renovation in the prime Northwest Hills area, and worked with an all-local team for its design, build, and decor. 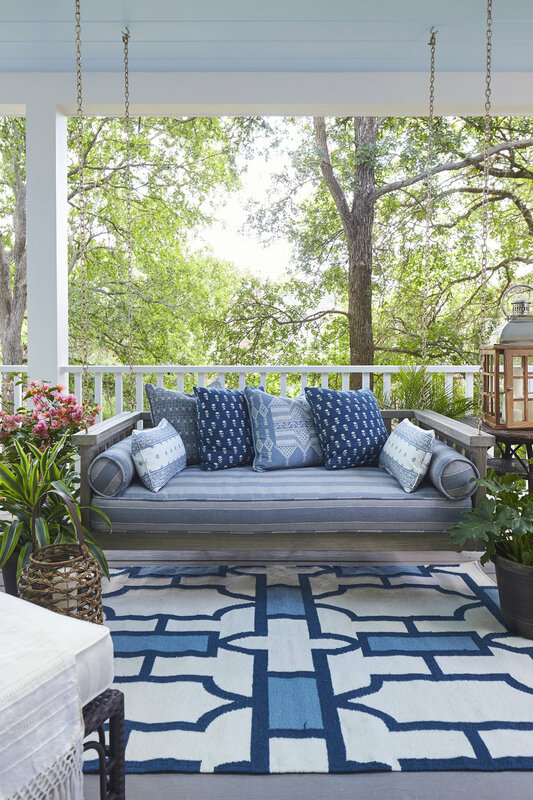 Meredith Ellis, owner of Meredith Ellis Design, managed the interior design with much of the fabric, wallpaper, rugs and accessories selected through JAMES Showroom, which is owned and operated by Ellis. Chris Sanders of Sanders Architecture oversaw the home’s architecture. Sanders finished house plans will be available for purchase via SouthernLiving.com. David Wilkes Builders is managing the construction. 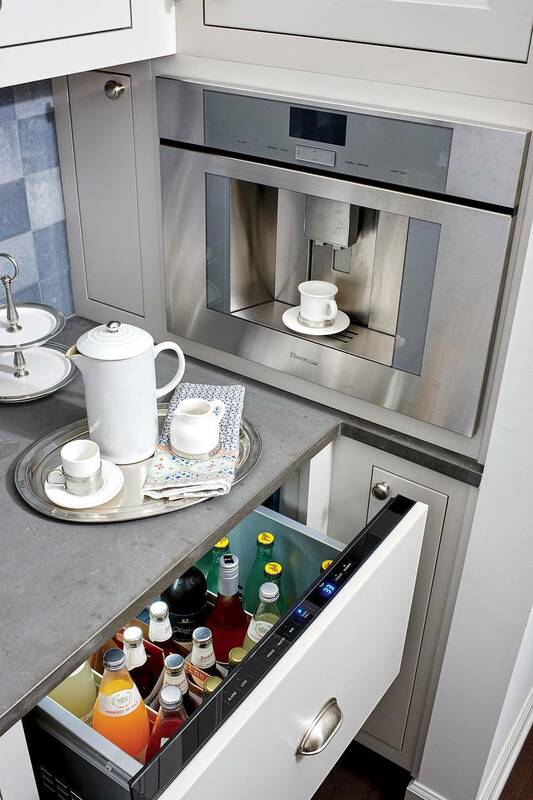 Many changes were made in an effort to modernize the home and open up the rooms to give it an airy feel. In the family room, the team eliminated the breakfast room, and incorporated those spaces into a more casual family room that connects to the kitchen. The den wall was taken down, and the space was reappropriated as a sunroom, filling the main living area with more light. 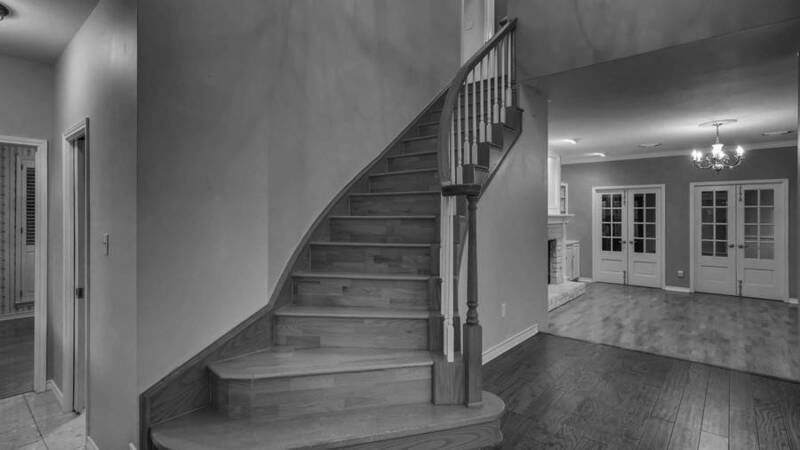 Chris "reprogrammed" the layout of the house into a more centralized, open floor plan with a connected kitchen and family room at the heart of it. 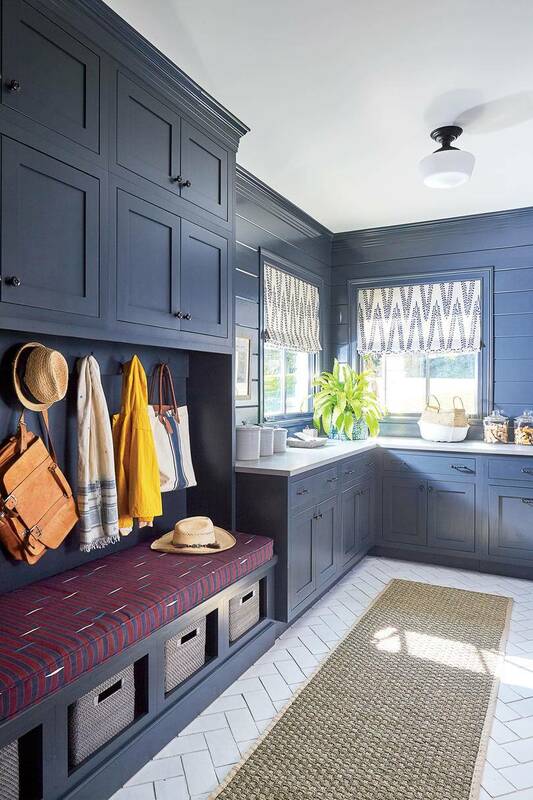 He reworked the majority of the old kitchen space into a mudroom and walk-in pantry. Meredith wanted a blue kitchen without dating the home too much. In a city like Austin where everyone owns stand up paddle board, kayaks and outdoorsy gear, families need a lot of storage in a mudrooom. Chris maxed out a back hallway connected to the kitchen to meet this need. 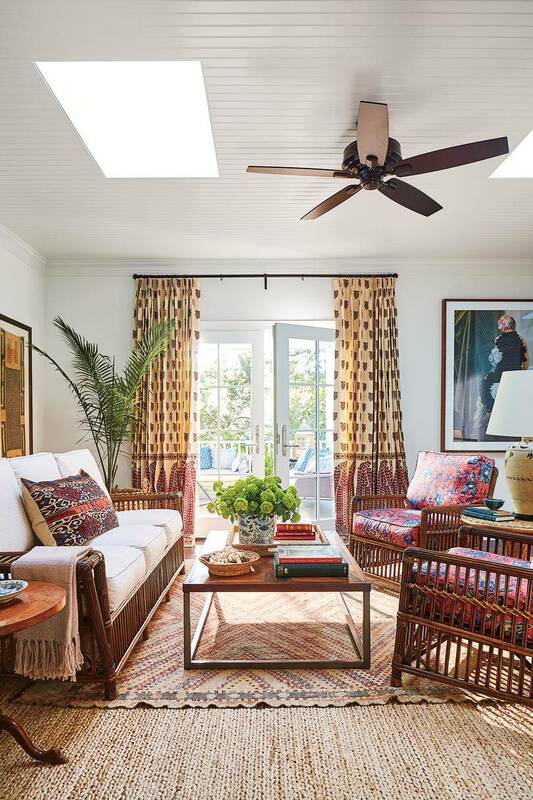 Meredith wanted to convey a feeling of being on vacation in the sunroom, creating a sun-filled room for those days where it’s simply too hot to be outside. In the powder room, Meredith shows off her unmatched skills for layering patterns. "I wanted to show that you can use a pattern on a pattern in a toned-down way," says Meredith, who layered two different printed fabrics in this small space. Worried that cloth will stain in a powder room? Meredith has all of her fabrics treated with Fiber Seal a professional stain treating company with locations all across the South. In the master bedroom , Meredith chose a perfectly calming palette, going with "Sherwin-Williams' Quietude (SW 6212), a deep celadon. For the master bath, new oversize windows flood the bath with sunlight. 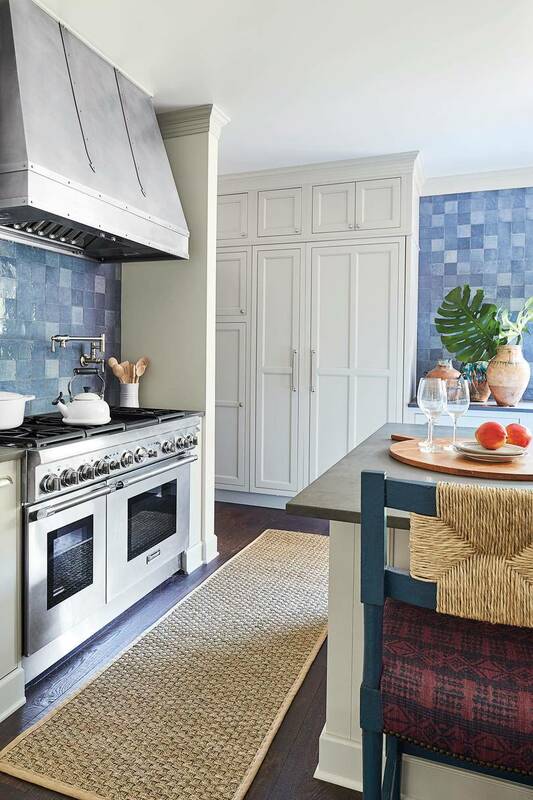 Meredith maintained the clean decor scheme by selecting Ann Sacks Calacatta Borghini Mosaics Tri-Weave marble tiles for the floor, and Calacatta Daniele tiles for the walls. A freestanding tub (Cast Iron Double Ended Clawfoot Bathtub) warms up the room. A moonlike pendant hanging above adds even more texture (O'Connor Chandelier). In the girl’s room, the "distinctive iron bed was in a New York City design show house in the 1970s. I found it at the Original Round Top Antiques Fair and had to have it," says Meredith. Using the palm-topped four-poster bed as the room's kick-starter, the designer continued the look of girlie whimsy by covering the walls in a soft pink fabric (Siam in Shell by Carolina Irving Textiles). "The pattern helps disguise the sharp angles of the walls," she says. Removing the old hot tub from the back porch, repairing the rotten wood, and demoing the heavy design elements created a lighter, brighter space to hide from the Texas sun. It is replete with skylights, clean trim, and all-new Foundations decking from ChoiceDek. Meredith’s propensity for working with unexpected colors comes to life in the spice-colored guest room (Sherwin-Williams' Cavern Clay SW 7701). Most would shy away from using such a rusty orange shade, but this is University of Texas Longhorn country after all. The cozy room now feels like the inside of a a warm cup of spiced cider. 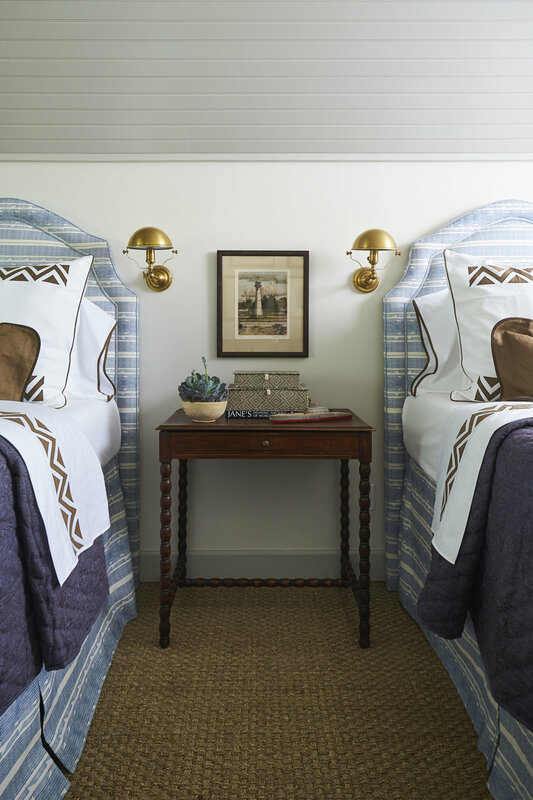 In the boy’s room, Meredith played with textures and paneling to create a nautical theme of blues, brass, and natural wood, taking advantage of the shape of the room as part of the design. A seagrass rug brings in even more texture. The Idea House, located in Northwest Hills, will be open to the public from June 15-November 15 2018 for tours. There will be a $20 entrance fee, and a portion of proceeds will go to Dell Children's Medical Center. Hours will be Wednesday – Saturday 10:00-4:00 p.m. and Sundays noon-4:00 p.m.
For more information, visit Southern Living’s website. For tickets, click here.